And they're totally delicious. How can they not be, when they're two of our fave foods combined into one cheesy bite? Plus, they only require four ingredients so they're a cinch to make. Follow the recipe below for pint-sized pizza cupcakes. 1. Preheat your oven to 350 degrees F and spray a muffin pan with non-stick spray. 2. In a bowl, combine the pizza sauce, pepper and pepperoni. 3. Press one wonton wrapper in each muffin spot and place 1 Tbsp of your topping on it. 4. Press another wonton wrapper on top of the filling. Then place another tablespoon of topping on the wrapper, dividing what's rest of your mixture among all the cupcakes. Press the topping into the wrapper. 5. Sprinkle with cheese and bake for about 15 minutes or until golden brown. Let cool and enjoy. 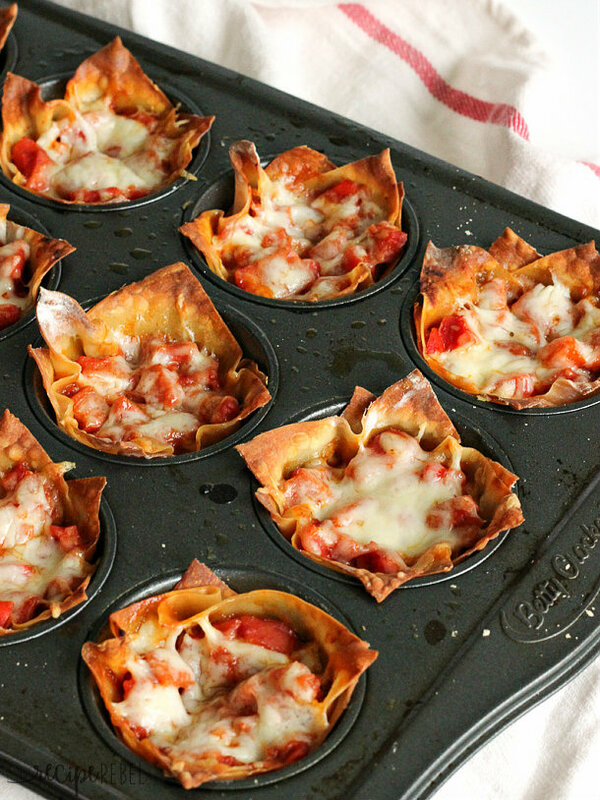 Have you ever made pizza cupcakes? Share your fave toppings in the comments! Tutorial credit: The Recipe Rebel.